Chemanthi stitch (sometimes referred to as chemanthy stitch or chemanthi work) is an Indian embroidery stitch that creates a flower-like design. The stitch is typically worked in a circular formation, but some variations allow you to work it in other shapes too. The word chemanthi means flower and specifically chrysanthemum, and you can see why it's called that! A completed round of this stitch does resemble the flower it's named for. 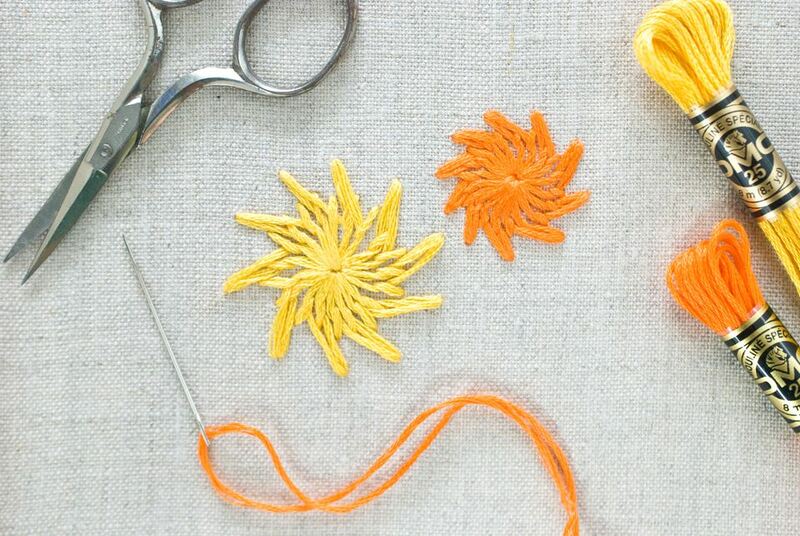 At first, chemanthi stitch can look confusing, but once you've worked a few of the petals, you'll get the hang of it. Then you'll be ready to work this into your next project! It's best to work this stitch with circular guidelines. Mark out three concentric circles using a water-soluble pen, and mark the center of the inner circle with a dot. The size of the circles is up to you. They can be evenly spaced as shown here, or with some closer or farther apart. In fact, changing the spacing will alter the look of the stitch for variation. Each stitch works along the lines of the three circles and is actually made up of four stitches that follow the numbered points. As you work, it's best to keep the tension of the fabric a little loose so you can do each step of the stitch with the sewing method. Start by bringing the needle up at the center of the circles. Working directly above the center, dip the needle down at point 1 and back up at point 2. Go down at the center point and back up at point 3, keeping the working thread under the tip of the needle. Go down at point 4 and come back up at point 2. Dip the needle down through the center point and back up at point 5, keeping the working thread under the needle. When you have come up at point 5, you are now ready to start the next stitch, going down at point 1 and back up at point 2. Repeat the process until you have made your way around the entire circle, rotating the hoop as you go. To finish off the last stitch, take the needle under the very first stitch you took, which started at the center and went down at point 1. Go back down nearby and the stitches will look almost seamless. Use thread conditioner to help tame your thread and prevent it from untwisting, which will ruin the look. Try working this stitch toward the left instead of the right to switch the direction of the petals. By altering the spacing of the guidelines as well as how far your stitches are from each other, you can create flowers that are quite unique. Some stitchers work this stitch very close together for a dense flower! The examples shown here were made with all six strands of standard embroidery floss. Using fewer strands or a thin weight of perle cotton will result in a much more delicate design.